(VEN) - The money market has been stable since the beginning of the year, with money supply guaranteed and some deposit interest rates on a downward curve. 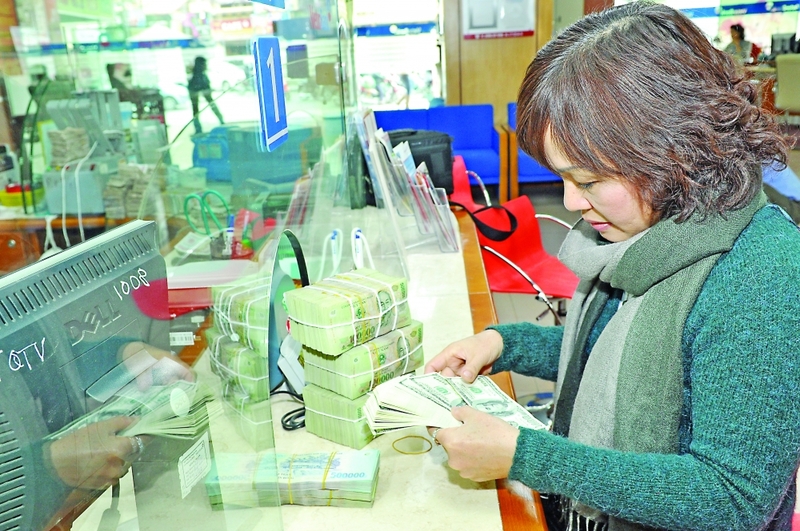 After the Lunar New Year (Tet) holiday in February, the liquidity of the banking system was improved, helping the central bank net withdraw more than VND51.55 trillion between February 11 and 15. Good liquidity thanks to the return of cash into the banking system after Tet, has helped interest rates in the interbank market decrease to 4.5 percent per year for overnight loans, 4.64 percent for one-week loans, 4.7 percent for two-week loans, and 4.84 percent for one-month loans. In addition, abundant credit institution capital contributed positively to bidding and capital raising activities through the government bond channel. From February 11 to 15, the State Treasury raised VND10.95 trillion through government bond auctions with different maturities of 7-30 years. According to a report from the Saigon Securities Inc (SSI), along with the stability of the money market, pressures on interest rates and exchange rates have eased significantly, and foreign exchange reserves have increased sharply. In addition to the weakening of the US dollar, an abundant supply of the US dollar has stabilized exchange rates in commercial banks and pushed them down in the free market, with the dollar traded at VND23,160-23,250 and VND23,200-23,220, respectively. With favorable movements of the market, deposit interest rates listed at commercial banks after Tet have fluctuated on an overall downward trend. For example, the Asia Commercial Bank (ACB) has lowered interest rates by 10 basis points for one-month deposits to 5.1 percent per year, while the Vietnam Joint Stock Commercial Bank for Industry and Trade (VietinBank) has slashed interest rates for six-month and one-year deposits by 30 points to 5.5 percent per year and 6.8 percent per year. In addition, the Joint Stock Commercial Bank for Investment and Development of Vietnam (BIDV) revised down its deposit rate for five-month tenor by 30 basis points to 5.2 percent per year. According to economists, deposit interest rates are expected to remain steady in the next few months since banks have to make savings attractive in order to compete with other investment channels.